The Attitude Era was a period in the WWE that began as a direct result of the Monday Night Wars and culminated with the conclusion of the Wars in 2001. This Era was defined by a radical shift in programming content. In contrast to the more traditional, family-friendly content that was common in WWE programming, the Attitude Era sought to attract the young adult demographic viewers by transforming the product into an edgier and more controversial form of entertainment. Traditionally heroic characters were replaced with disaffected anti-heroes and family-friendly storylines were replaced with controversial plots based on shock value, similar to the "Trash TV" genre popularized in the 1990s. The fans were jubilant each and every week when their hero spat in the face of authority, instead of respecting them and it was undoubtedly more brutal as compared to what we see today. 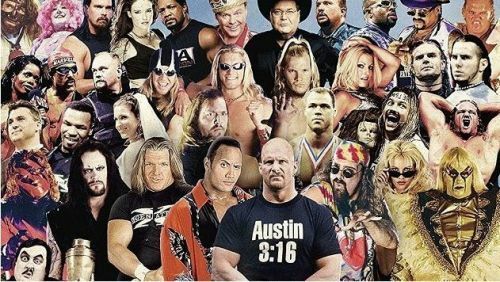 WWE Superstars of The Attitude Era at one glimpse. Now, as we continue to enjoy the “New Era” WWE has given us, let’s take a look back at top five matches that defined the “Attitude Era”. Mike Tyson-The Guest Enforcer of the match with Austin. There are very few matches that can be immediately identified as the turning point of a company, much less the start of an Era. This is one of them. One of the most hotly anticipated matches in WWE history (thanks to the involvement of boxing star Mike Tyson as a guest enforcer), the match was slated to be the main event of WrestleMania IV. Both Austin and Michaels entered the match with injuries affecting them. Michael’s injury was so severe that this ended up being his last televised match until Summerslam 2002. Although his moveset was somewhat limited due to his injury, Michaels showed his pitbull-like tenacity and worked through the pain. Even though Michaels showed guts that only few can, this was Stone Cold’s show. For over a year prior, Austin had been gaining momentum, climaxing during his in-ring altercation with Tyson weeks before this match.